Typically, Japanese Sushi and Sashimi preparations involve raw fish (where fish is used) but this is not always the case. 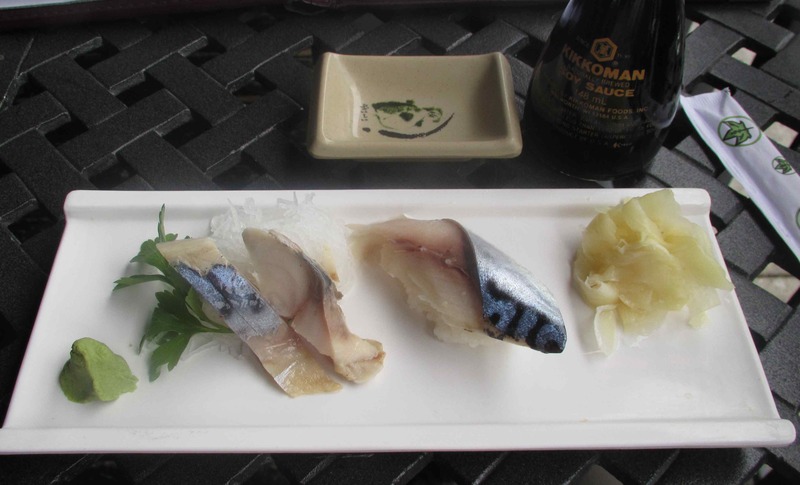 Indeed, some varieties, most notably mackerel, are lightly first lightly pickled using salt and sweetened vinegar. In some ways, Saba Sashimi, or Sabazushi (as preparations with Sushi rice are known) is a bit like a Japanese counterpart to the Latin American dish called Ceviche that I sampled and then wrote about a few days ago. Generally however, Saba undergoes a very brief pickling (often less than an hour), while Ceviche is typically (although not always) marinated for several hours. I have eaten and enjoyed Japanese style pickled mackerel many times, but the day after sampling the aforementioned Ceviche, I hastened to the Wasabi restaurant in Ottawa’s Byward Market to taste it again for the purposes of comparing and contrasting the two. At Wasabi, Saba is offered as both a sashimi and a sushi item and, not being able to decide between the two, I opted for both. As you can see, the two delicacies were plated with wasabi (which I am not keen on), shredded daikon, and pickled ginger. Soy sauce was also provided on the side. There were three pieces of fish and, though the single piece of sushi was not terribly well formed, the color of the skin was absolutely gorgeous. I dipped the very edge of the sushi rice in just a little soy (foregoing the ginger entirely) but I sampled the sashimi slices without any accompaniments at all as I always think this is overkill. Great description. I feel like I can taste it. Do you think this would be something you could try to recreate at home? Yes, the process isn’t terribly difficult… a bit like curing fish before cold smoking. My only trouble is the availability of fresh fish other than Arctic Char. And especially mackerel has to be very fresh. On the other hand, all mackerel is flash frozen to kill some kind of parasite. So I guess you could use frozen mackerel to make this, if you can get good quality frozen mackerel that is. Nice post! I’ll have to try making my own. I have been exploring for just a little for just about any high quality content within this types of region. Exploring inside Yahoo I at last found this web site. Perusing this info Thus i’m very happy to convey this I’ve a great uncanny sensation I discovered exactly what Required. We most certainly will make sure to don’t neglect this website and provide it a peek regularly.